In part one of this series we argued that one key ingredient for a successful scale-up company is optimisation of their business processes at the right time. In part two, after a short review of options, we suggested that the Business Model Canvas might be a very suitable tool for solving this problem. Advice to scale-up companies is often heavily focused on team and leadership skills. It could be reduced to "hire well, fire well, and hire great managers early". In fact, these are the 'must dos' listed in a Forbes article from 2015. I'd say that was necessary but not sufficient. I can't see a scale-up company making a top 50 list of disruptive and game-changing businesses just because they hire well. It even ignores good points made by people interviewed for the same article, who talked instead or as well about scaling processes and using KPIs. When we do look at such a list of disruptive companies, we find that frequently they are innovating on business models. Therefore, it makes sense to use a tool that lets you describe and design the business model. 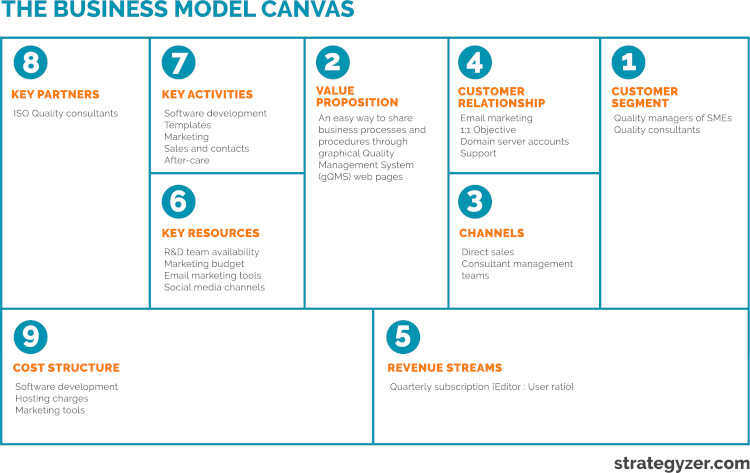 So what is the Business Model Canvas (BMC)? Very briefly, the BMC is a one page template for developing and documenting business models. 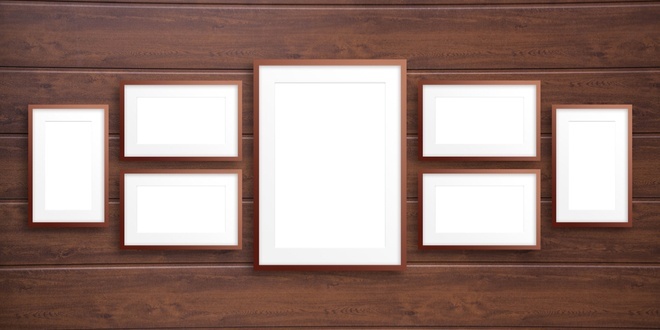 The canvas element comes from the 'poster' style format of the tool, which consists of the nine essential building blocks of a business model, as determined by Alexander Osterwalder from his analysis. There are different ways for using the BMC, from a workshop with whiteboard and sticky notes, to a web-based tool such as Strategyzer. I created my own forms-driven tool using the Forms Builder feature in Cognidox, and linked the fields to a Word template which then generates PDFs of the current version of my BMC. This allows me to create controlled (draft, issued, approved) versions and send the document around the team for review. This is not the place for a tutorial on how to use the BMC, but one common problem is knowing the best order for filling-in the nine boxes. What follows is a quick summary of each, in the order most often recommended for their completion. Channels – how you fulfil your orders / path to customer. For businesses such as Amazon or Air BnB, it would be the website plus mobile apps. For the wine company above, there are Retail stores as well as direct B2B sales. There could also be VARs or Wholesalers in the mix. Customer Relationship - how you contact and inform buyers. Note that it goes beyond how you sell, and includes for example Technical Support, Customer Retention, Customer Happiness Team, and so on. Revenue Streams - how you collect revenue. For Air BnB, it's a percentage of the booking fee. It could be direct sales of stock. It could be recurring revenue such as monthly subscriptions. Key Resources - assets you need to deliver the value proposition. One type of business model might depend on Factories, Warehouses, Suppliers, and Logistics. Another might depend on an On-line Platform and/or application Marketplace. Companies depending on a network effect might look to their Community. Most companies include People (R&D, Sales, Marketing, etc. ), Intellectual Property, and Brand in the list. Key Activities - essential things the business needs to do to make its business model work. Examples include: Customer care, Document and records management, Accounts payable and receivable, HR processes, Logistics, Manufacturing and warehousing, Research and development, Sales proposals and contracts, and Supplier contracts and procurement. Partners - outsourced Activities that can be done better, cheaper, etc. by others. A common mistake is to duplicate what you entered under Channels - they are different. Cost - what you need to spend money on. Usually looks at fixed and variable costs, and how these are impacted by scale. I was maybe a little flippant above on the topic of Value Propositions. In fact, they are often the hardest part of the BMC. So much so that Osterwalder & Strategyzer have developed an extra tool called the Value Proposition Canvas to assist. As with most business analysis tools, you find bad examples of BMCs that are perhaps created too quickly. These are often little more than nine numbered lists - very disjointed and certainly not connected across the blocks. There may be a good pairing of customer segments and value propositions, but at the same time there might be "orphaned" revenue streams or channels that don't trace back to a customer segment. The better examples are thread-based - they follow connections from block to block. I want to focus now on how to use the BMC to get a handle on the strategic activities that in turn can be deconstructed into process groupings and the processes themselves. The clue is in the title: Activities. The Key Activities in our BMC are traceable back to value propositions and thence to customer segments. If we have followed the BMC correctly, we can be confident we are dealing with the strategic goals of the enterprise. Each key activity in the BMC is a top-level placeholder for a process grouping. The second step is to link Key Activities with Key Resources - there should be a mapping or else we have an "orphan" problem that needs addressing. It could be that we have correctly identified a key resource but forgot to include what they do as a key activity. Or, the other way around. It's a quick and easy way to test the model. As an aside, there is value in using extra tools to explore relationships and interfaces between Key Resources. There are many to choose from: business team intersection diagrams, cross-functional flowcharts, and RACI charts are just some. The third step is to link Key Partners to Key Activities. Again, this is to confirm there is a mapping. If we have an offshore development team that isn't reporting to and being managed by e.g. the R&D activity, we are likely to have a problem. The fourth step is to link Key Activities to Cost Structure. First aim is again to ensure there is a mapping, but the more important goal is to understand the weighting that each activity brings to bear on the cost structure. Our product cost, for example, may be primarily determined by the fact that each customer solution is hand-crafted. Or, because we have / don't have a 'light touch' customer relationship model for sales. These extra steps ensure that we are confident in the completeness and accuracy of the Key Activities block of the BMC. I have 'gone along' so far with the general idea that a key BMC benefit is to put it all on one canvas. But, at this stage I would point to another common BMC mistake - too many ideas in one canvas. It is instead better to break out the separate threads such that there is one canvas for each. This will result in a "BMC Library". This is one of the reasons why I use the form-based approach described above. There will be many BMCs and creating them quickly is a desirable goal. The ability to link them is also important, and by using Cognidox document relationships are automatically created by cross reference to other document part numbers. None of the above is complicated or requires new skills to master. It does not start you off with a collection of complex chart templates and a library of unusual icons that then makes for a slow learning curve. And yet, it should ensure that the business processes you identify are linked to the strategic activities of the company. Once you have identified your strategic business processes, you are now much better placed for Business Process Improvement. We will explore that in another post.